Arsine is an inorganic compound with the formula AsH3. This flammable, pyrophoric, and highly toxic pnictogen hydride gas is one of the simplest compounds of arsenic. Despite its lethality, it finds some applications in the semiconductor industry and for the synthesis of organoarsenic compounds. The term arsine is commonly used to describe a class of organoarsenic compounds of the formula AsH3−xRx, where R = aryl or alkyl. For example, As(C6H5)3, called triphenylarsine, is referred to as "an arsine." At its standard state, arsine is a colorless, denser-than-air gas that is slightly soluble in water (20% at 20 C) and in many organic solvents as well. Whereas arsine itself is odorless, owing to its oxidation by air it is possible to smell a slight garlic or fish-like scent when the compound is present above 0.5 ppm. This compound is generally regarded as stable, since at room temperature it decomposes only slowly. At temperatures of ca. 230 °C decomposition to arsenic and hydrogen is rapid. 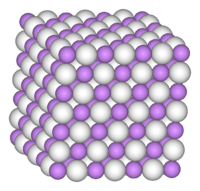 Several factors, such as humidity, presence of light and certain catalysts (namely aluminium) facilitate the rate of decomposition. Arsine will react violently in presence of strong oxidizing agents, such as potassium permanganate, sodium hypochlorite or nitric acid. 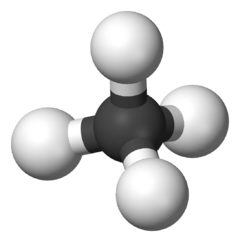 For microelectronic applications, arsine can be provided via a sub-atmospheric gas source. In this type of gas package, the arsine is adsorbed on a solid microporous adsorbent inside a gas cylinder. This method allows the gas to be stored without pressure, significantly reducing the risk of an arsine gas leak from the cylinder. With this apparatus, arsine is obtained by applying vacuum to the gas cylinder valve outlet. For semiconductor manufacturing, this method is practical as these processes usually operate under high vacuum. Since before WWII AsH3 was proposed as a possible chemical warfare weapon. The gas is colorless, almost odorless, and 2.5 times denser than air, as required for a blanketing effect sought in chemical warfare. It is also lethal in concentrations far lower than those required to smell its garlic-like scent. In spite of these characteristics, arsine was never officially used as a weapon, because of its high flammability and its lower efficacy when compared to the non-flammable alternative phosgene. On the other hand, several organic compounds based on arsine, such as lewisite (β-chlorovinyldichloroarsine), adamsite (diphenylaminechloroarsine), Clark I (diphenylchloroarsine) and Clark II (diphenylcyanoarsine) have been effectively developed for use in chemical warfare. The Marsh test was widely used by the end of the 19th century and the start of the 20th; nowadays more sophisticated techniques such as atomic spectroscopy, inductively coupled plasma and x-ray fluorescence analysis are employed in the forensic field. Though neutron activation analysis was used to detect trace levels of arsenic in the mid 20th century, it has since fallen out of use in modern forensics. For the toxicology of other arsenic compounds, see Arsenic, Arsenic trioxide, and Arsenicosis. The toxicity of arsine is distinct from that of other arsenic compounds. The main route of exposure is by inhalation, although poisoning after skin contact has also been described. Arsine attacks haemoglobin in the red blood cells, causing them to be destroyed by the body. The first signs of exposure, which can take several hours to become apparent, are headaches, vertigo and nausea, followed by the symptoms of haemolytic anaemia (high levels of unconjugated bilirubin), haemoglobinuria and nephropathy. In severe cases, the damage to the kidneys can be long-lasting. 1 2 3 4 5 6 7 "NIOSH Pocket Guide to Chemical Hazards #0040". National Institute for Occupational Safety and Health (NIOSH). ↑ Levvy, G.A. (1946). "The Toxicity of Arsine Administered by Intraperitoneal Injection". Wiley Online Library. Retrieved 3 December 2014. 1 2 3 "Arsine". Immediately Dangerous to Life and Health. National Institute for Occupational Safety and Health (NIOSH). 1 2 Holleman, A. F.; Wiberg, E. (2001) Inorganic Chemistry Academic Press: San Diego, ISBN 0-12-352651-5. 1 2 3 4 Institut National de Recherche et de Sécurité (2000). "Fiche toxicologique nº 53: Trihydrure d'arsenic" (PDF). Retrieved 2006-09-06. ↑ Nielsen H. H. (1952). "The Molecular Structure of Arsine". The Journal of Chemical Physics. 20 (12): 1955–1956. doi:10.1063/1.1700347. ↑ Bellama, J. M.; MacDiarmid, A. G. (1968). "Synthesis of the Hydrides of Germanium, Phosphorus, Arsenic, and Antimony by the Solid-Phase Reaction of the Corresponding Oxide with Lithium Aluminum Hydride". Inorganic Chemistry. 7 (10): 2070–2. doi:10.1021/ic50068a024. ↑ Herrmann, W. A.; Koumbouris, B.; Schaefer, A.; Zahn, T.; Ziegler, M. L. (1985). "Generation and Complex Stabilization of Arsinidene and Diarsine Fragments by Metal-Induced Degradation of Monoarsine". Chemische Berichte. 118 (6): 2472–88. doi:10.1002/cber.19851180624. ↑ Atwood, D. A.; Cowley, A. H.; Harris, P. R.; Jones, R. A.; Koschmieder, S. U.; Nunn, C. M.; Atwood, J. L.; Bott, S. G. (1993). "Cyclic Trimeric Hydroxy, Amido, Phosphido, and Arsenido Derivatives of aluminum and gallium. X-ray Structures of [tert-Bu2Ga(m-OH)]3 and [tert-Bu2Ga(m-NH2)]3". Organometallics. 12: 24–29. doi:10.1021/om00025a010. 1 2 R. Minkwitz, R.; Kornath, A.; Sawodny, W.; Härtner, H. (1994). "Über die Darstellung der Pnikogenoniumsalze AsH4+SbF6−, AsH4+AsF6−, SbH4+SbF6−". Zeitschrift für anorganische und allgemeine Chemie. 620 (4): 753–756. doi:10.1002/zaac.19946200429. ↑ Marsh, James (1836). "Account of a method of separating small quantities of arsenic from substances with which it may be mixed". Edinburgh New Philosophical Journal. 21: 229–236. ↑ Fowler B. A.; Weissberg J. B. (1974). "Arsine poisoning". New England Journal of Medicine. 300 (22): 1171–1174. doi:10.1056/NEJM197411282912207. ↑ Hatlelid K. M. (1996). "Reactions of Arsine with Hemoglobine". Journal of Toxicology and Environmental Health Part A. 47 (2): 145–157. doi:10.1080/009841096161852. ↑ "Arsine". RTECS. National Institute for Occupational Safety and Health (NIOSH).